The Malta Council for the Voluntary Sector (MCVS), responsible to organise activities under the VO Fund according to the VO Act (Cap. 492) of the 11th December, 2007, is requesting the Expression of Interest for the Provision of Training and Mentoring/Consultation. Accessing EU and Local Funding. Session days: Saturday Mornings from 9.00 a.m. till noon or weekdays evenings from 6.00 p.m. till 9.00 p.m. Participants: one-to-one with an organisation or particular group. All the above mentioned services and facilities should be provided in an itemised manner which shows the whole breakdown of expenses in the submitted expression of interest and including VAT. More information can be obtained from Mr Mauro Pace Parascandalo on email (mauro.pace-parascandalo@gov.mt) or by phone on 2248 1110. Bidders are to submit one (1) copy of their Request for Quotation for the Provision of Training and Mentoring/Consultation clearly marked “Request for Quotation for the Provision of Training and Mentoring/Consultation”, on the sealed envelope and documents are to be entitled “Request for Quotation” for the Provision of Training and Mentoring/Consultation. 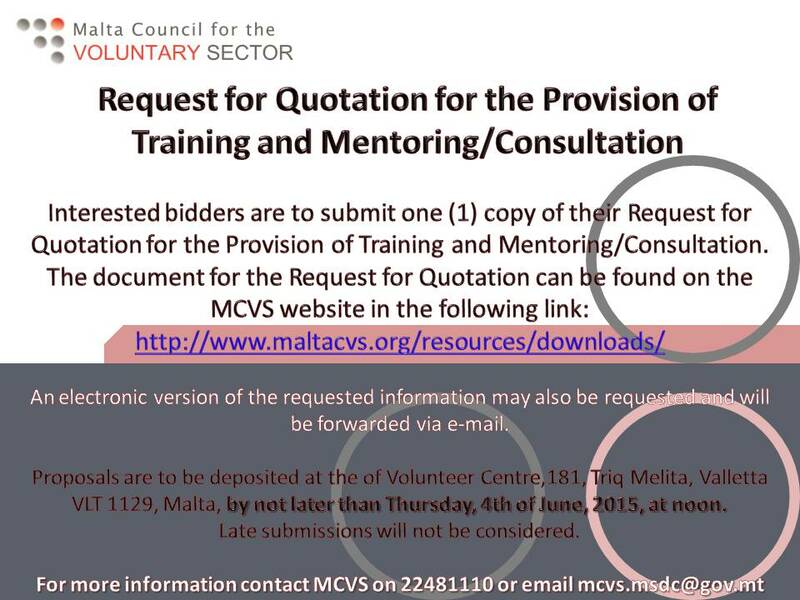 The document for the Request for Quotation can be found from (www.maltacvs.org) under Resources/Documents. An electronic version of the requested information may also be requested and will be forwarded via e-mail. Proposals are to be deposited at the of Volunteer Centre,181, Triq Melita, Valletta VLT 1129, Malta, by not later than Thursday, 4th of June, 2015, at noon. Late submissions will not be considered.